Close to the U.S.-Mexico border and offering free Wi-Fi the pet-friendly Knights Inn & Suites Eagle Pass is an attractive choice for budget travelers.The 41 rooms of the two-story Knights Inn & Suites Eagle Pass offer free Wi-Fi cable TV mini-fridges microwaves and coffeemakers. Guests can make free local calls and the hotel staff is happy to assist with faxing needs. Pets are welcome for a fee. The hotel provides free parking. 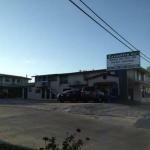 The hotel is in southwest Texas off US-277 between Del Rio and Laredo. It's six miles from the Mexican border town of Piedras Negras. Sul Ross State University is two miles east and the Eagle Pass Multipurpose Center is two miles to the south. Maverick County Fairgrounds is six miles away. Try your luck at Kickapoo Lucky Eagle Casino eight miles away. It's a 56-mile drive to Del Rio International Airport.